It took seven decades, but "Rosie the Riveter" finally go her day -- officially and forever. Many of the real-life women who started a revolution so long ago are still outspoken and proud of their contribution to history. RICHMOND, California -- It took seven decades, but "Rosie the Riveter" finally got her day -- officially and forever. Really big rivets and welds are the stuff of hard work, still holding on the Red Oak Victory, a ship anchored at Point Richmond. Since World War II, she's become a bit rusty in places and doesn't look nearly as good as some of the welders who put her together. "We were young," said Connie Gomez, who will be 94 next month. "We could do anything." Gomez sat alongside Eddie May Crummie, 97, and 'youngster' Marian Sousa, 93. In this crowd, it was okay to ask because on Rosie the Riveter Day at the Rosie the Riveter Museum, these real women added context to the statues depicting them. "Did I feel patriotic?" Catherine K. Morrison asked. "I just felt like we had a mission to work hard and bring our boys home. The history came later." 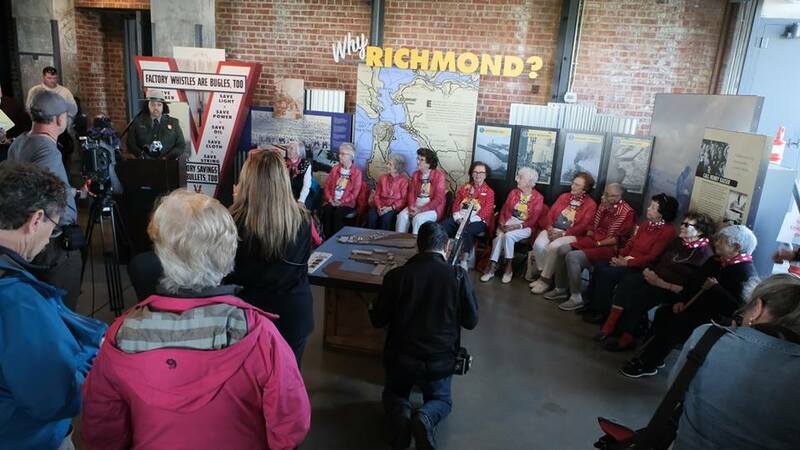 The ladies who gathered in Richmond are some of the women who built the planes, ships and weapons that helped the U.S. and allies win World War II more than seven decades ago. A group of real-life 'Rosie the Riveters' appears at the Rosie the Riveter Day celebration in Richmond, Calif. on March, 21, 2017. However, they note a caveat. "I think the riveters were in the airplane factory," corrected Priscilla Elder. The Red Oak Victory is not an airplane. It's one of some 700 vessels built by a force of 90,000 men and women in Richmond's Kaiser Shipyards during the war. "Rosie the Riveters," or welders, put together some 142 ships. It was not easy work. "I worked building the deck houses three-stories high," said Phyllis Gould. "I had to climb a ladder with a coil of welding line on my shoulder." This is an undated image of a "Rosie the Riveter" during WWII. In doing so, they were pioneers, 30,000 Rosies earning equal pay with 60,000 men, sometimes with unanticipated results. "I married my boss. We had a little affair during the war," said Mary Torres. "Oh God, what am I saying, now my son is going to kill me." That marriage might have been a byproduct of what the Rosies started: a revolution. Maybe that's why after Tuesday's ceremony, Lacy Nelson brought her five and 10-year-old daughters out to the Red Oak Victory. "The lesson is women can do whatever they put their minds to," she said, while holding her little girl's hand. It was nothing less than the start of women's liberation, seven decades ago. When women's liberation did arrive, welder Catherine Morrison said, "I'm not burning my bra!"